I'm weird. A polish doesn't lose my interest because it looks like something I own. Instead I must have it and I must compare it, especially if the one I have is pricey. When I was browsing Urban Outfitters' polish rack and biding my time because the guys were in the comic shop, I saw something familiar. Luster jumped out and screamed "Hey! 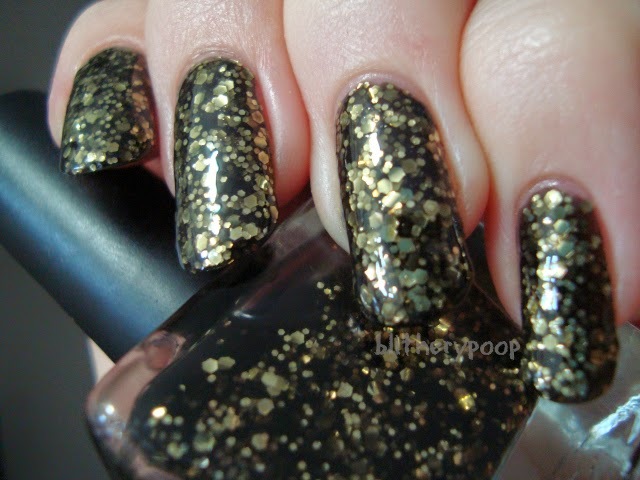 I look a lot like Deborah Lippmann Cleopatra In New York!" This meant I needed it, so I bought it without hesitation. 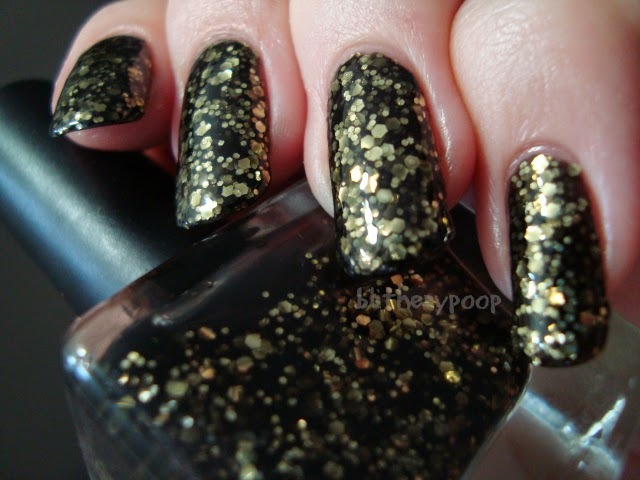 Luster has large and small gold hexagonal glitter in a black jelly base. I got Cleopatra In New York for xmas '12 but a possible dupe is usually more exciting to me than the original, so I wound up wearing Luster first. The idea to it is exactly the same, but the execution's a little different. There is a lot of glitter in Luster. "Too much" is a matter of personal taste, but it's clearly more than in CiNY. The base is sheer, so it took three coats to hide my nail line. This amplifies the amount of glitter, but also creates an interesting depth. There's something really satisfying about seeing the little glitter floating over the larger pieces. It's a bit lumpy/thirsty, but it smoothed out nicely with Gelous. CiNY is sheerer, and has less glitter, but otherwise Luster is very close! They're similar enough that Google knitted the swatch and comparison into one of those stupid Auto Awesome gifs. Both are three coats. The sheerer base and sparse glitter give CiNY a slightly different look. It's deeper, but it's also less intense. They're close enough that you probably don't need both, but you probably have a preference between the two. The price tags are quite different. Luster's sticker price is $5, but they have a 2/$8 permanent deal. CiNY's $18. If I had to pick between the two, I like CiNY more, but I wouldn't pay $18 for it. If you prefer it, but have sticker shock, you could probably frankendupe it very easily. Luster, Essie Licorice, and a bit of clear would get you there for $13.50-ish and you'd have "leftovers" to play around with some more. Bottom line: Considering that it's less than one third the price of the high end version, Luster is a close-enough "dupe" as far as I'm concerned. It's weird looking at my nails at this length since I shortened them on Thursday. I was growing them out to maybe reshape them, but a break killed that. Oh well. I think they're better at the length they are now...but I'm eternally waffling on that. At least I don't click when I type now.